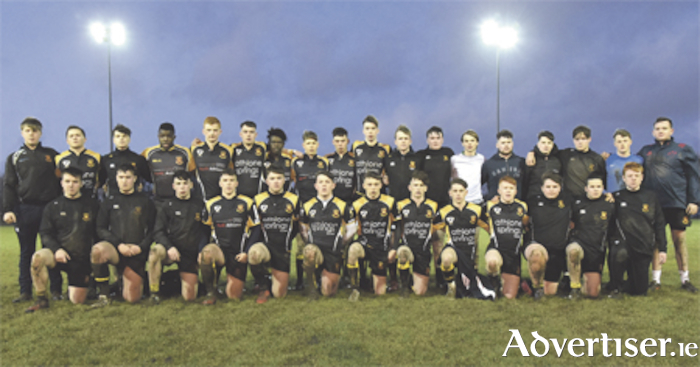 Buccaneers U18.5’s won the inaugural Rafeek Khan Memorial Cup at a cold and windy Ballinasloe RFC last Saturday evening, defeating Creggs 8-7 in a fiercely contested Connacht League final. A huge crowd turned out despite the conditions to celebrate the life of young Rafeek Khan, who was sadly lost to his family and friends a year ago. Rafeek played for Ballinasloe RFC and Garbally College and several of the current Buccaneers U18.5’s team played with him on those occasions. His mother Angie and immediate family were proud attendees at the game, engaging and speaking with the players from both sides before and after. The game was pulsating and, despite the terrible conditions, both sides played hard running rugby. On a scoreline of 8-7, with both sides scoring a try, the result in the end came down to a penalty excellently executed by Nathan Horan in the second minute of the game. With supporters expecting Buccaneers to kick for the lineout, the young fly-half decided to take the early points, and he was proven right. Playing with a very strong wind, Buccaneers reclaimed possession from the restart and worked the ball up the field, forcing Creggs to clear their lines. At the ensuing lineout, Darren Browne found Fergus Galvin despite a swirling wind and, following a number of carries, Buccs moved the ball swiftly to the wing where John Tumulty collected the final pass and romped in for the try. Nathan Horan was inches wide from the touchline with the conversion, but the Pirates had a crucial 8-0 lead in the game’s infancy. The first half ebbed and flowed and with the pitch in a quagmire it was testament to the fitness and conditioning of both teams that the tempo never dropped. Buccaneers probably played too much rugby instead of using the strong wind to kick for position, but Creggs were formidable in defence. The half finished 8-0 to Buccaneers, and their large contingent in the crowd wondered if that would be sufficient in the second half, with the increasing wind and deteriorating pitch conditions. The second half was simply unrelenting and Creggs, the only team to defeat Buccs in the league itself this season, threw the kitchen sink at Buccaneers. The ball handling and skills of the excellent Creggs backline was imperious and they constantly threatened the Athlone side’s defence. The defence held, however, and Buccs themselves had many counter incursions into the Creggs half, where Sol O’Carroll and Sean Flynn particularly excelled. With five minutes to go, Creggs finally got the try they deserved after a marathon camp on the Buccaneers line. The conversion followed, bringing the game to 8-7. It was going to be about who wanted it most, and with the bench emptied on both sides every player was exhausted. Buccaneers won their restart and marched the ball up field, phase by phase. It was their turn to show ball retention ability as they advanced to the Creggs five metre line. The advance was stalled with the Buccaneers pack encroaching over the touchline. A final lineout for Creggs would surely bring a huge kick down field and a final foray. However, in a thrilling last play, Creggs fumbled the lineout and several Buccaneers players formed and secured the ball. The referee blew the final whistle and Buccaneers players celebrated wildly with relief as much as joy. Fergus Galvin accepted the cup on behalf of his team and thanked the family of Rafeek, opponents Creggs and host club Ballinasloe for the wonderful occasion. The victory made it five wins in a row in the Connacht League for this young Buccaneers team. Many of the squad started playing rugby as minis under Derry Fitzpatrick and they have been the most successful Buccaneers youths side in recent years, winning six of out seven finals. More importantly, this panel of 35 players demonstrated the respect and integrity that they have as a group when talking with the family of the late Rafeek Khan, and by impeccably observing the presentation ceremony. This group now move on to focus on the Connacht Cup competition and, hopefully, a final date in the Sportsground in April. Before that, a serious encounter with Corrib awaits this coming weekend. However, if Buccaneers continue to work for each other as has been the case to date, it will take a great team and performance to deny them the double.